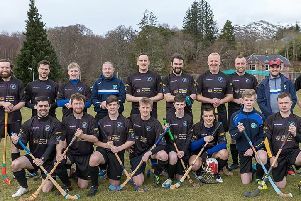 The Car Hire Hebrides Winter League has now reached the stage where even outstanding performances often bring little reward. Handicap allowance reductions are so punishing that some teams must wonder if they will ever pick up points again. Griddy Macleod and Kevin Macrae know that feeling more than most. On a rare day of blue skies, sunshine and stillness, Griddy and Kevin cruised effortlessly around the course to post the lowest gross score of the day, three under par. With a plus handicap, that score was adjusted to nett 42, two under par, and their reward was a meagre point. Dave Gilmour (pictured) was another who had little reward for an outstanding piece of golfing magic. Putting can be a little tricky at this time of year, made even more unpredictable when there is early morning frost on the greens. Dave wisely dispensed with the need to putt on the Foresters. His tee shot landed just beyond the hole and spun back to fall into the cup. A hole in one and some backspin thrown in: it is amazing that Dave managed to contain his excitement and finish his round. Unfortunately, his partner, Alistair Henderson, was absent last weekend and Dave could not maintain miraculous golf for long enough to earn points. Scoring, as it has been in every round of the Winter League to date, regardless of conditions, was again low. While nett 42, two under par, was only enough for a single point, the two pairings on nett 39 picked up nine points apiece. He may not have been as spectacular as his namesake, but Colin Gilmour and playing partner Duncan Maclean made a solid start to their round, with pars on the opening three holes, which included the Castle and Dardanelles. With a handicap allowance of ten strokes, negotiating those holes without any damage does wonders for confidence. By the time they reached the halfway point, Duncan and Colin still had eight handicap strokes to fritter away. Instead, they stuck doggedly to the task and, thanks in part to a birdie on the Short, their five under par nett total was their best performance in this campaign. Angus Innes and Lewis Mackenzie have been quietly moving up the overall league table in the past few rounds. Last weekend, another step was taken with another excellent showing. The outward half was a succession of par holes. That continued for the first three holes of the inward half before successive birdies on the Redan and Short and a par on the final hole. The winning total was nett 38, with two teams sharing the honours. Huw Lloyd and Marten James set the target after an impressive morning round. A double bogey on the Ranol was the only black mark in an otherwise perfect opening half. Like Lewis and Angus, Huw and Marten brought their round to life with back to back birdies on the Redan and Short. For any of those questioning how it is possible for Huw and Marten to have a handicap allowance of eight strokes, it is important to take into consideration the fact that Marten is the Club Captain and Huw is now a pensioner. Their reward was fourteen points, doubling their points total for the season. Matching the winning total in the afternoon were Sandy Bruce and Eddie Mackenzie, coincidentally a fully fledged pensioner and a wannabe pensioner respectively. Their round began with a bogey on the Miller but four par holes and a birdie on the Redan ensured they reached the halfway stage in level par. Despite bogeys on the Castle and Dardanelles, Sandy and Eddie recovered with a second birdie on the Ranol and two solid pars to finish, the fourteen points instrumental in kick-starting their Winter League challenge. The results from last weekend made no impact on the top of the overall Winter League leader-board, where Norrie Mackenzie and Roddy Martin remain in pole position, four points clear on 39 points. Three teams remain tied in second position: David Gray and Gordon Kennedy, Pete Middleton and Iain Moir, and Kenny “Spoonyan” Maclean and Scott Macaulay. Neil Rowlands and Darren Beattie remain in fifth spot on 34 points, one point clear of Magnus and Murdo Johnson and Griddy Macleod and Kevin Macrae. The main movers are Angus Innes and Lewis Mackenzie, up to eighth on 29 points, one point clear of Garry Murray and Eddie Rogers, who share ninth spot with the resurgent Huw Lloyd and Marten James.